Recurrent owns and maintains this site and the copyright and licenses to its content. Nothing at this site shall be construed as granting, by implication, estoppel or otherwise, any license or right to use any photograph, image, trademark, logo or service mark at the site. No act of downloading or otherwise copying from this site will transfer title to any software or material at this site to you. Anything that you transmit to this site becomes the property of Recurrent, may be used by Recurrent for any lawful purpose, and is further subject to disclosure as deemed appropriate by Recurrent, including to any legal or regulatory authority to which Recurrent is subject. Recurrent reserves all rights with respect to copyright and trademark ownership of all material at this site, and will enforce such rights to the full extent of the law. This site is for your personal and non-commercial use. You may not modify, copy, distribute, transmit, display, perform, reproduce, publish, license, create derivative works from, transfer, or sell any information, products, or services obtained from this site. Under no circumstances should any material at this site be used or considered as an offer to sell or a solicitation of any offer to buy an interest in any securities. 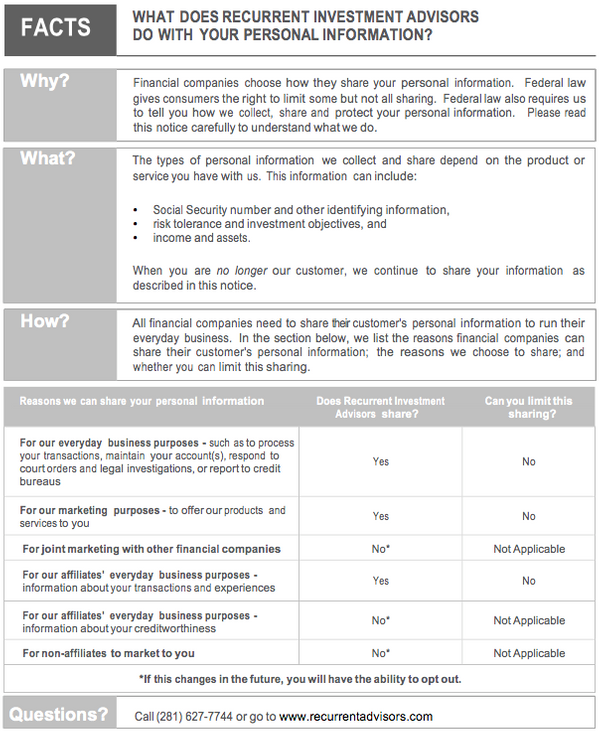 The material on this website does not constitute, and may not be used in connection with, an offer or solicitation by anyone in any jurisdiction in which such offer or solicitation is not permitted by law or in which the person making such offer or solicitation is not qualified to do so or to any person to whom it is unlawful to make such offer or solicitation. While Recurrent uses reasonable efforts to update the information on this site, Recurrent makes no representations or warranties as to the accuracy, reliability or completeness of any information at this site. Opinions, advice and any other content at this website, including the terms and conditions of your use of this service, are subject to change without notice or liability. The materials in this site are provided "as is" without warranty of any kind, either express or implied, to the fullest extent permissible pursuant to applicable law. Recurrent further assumes no responsibility for, and makes no warranties that, functions contained at this site will be uninterrupted or error-free, that defects will be corrected, or that the site or the server that makes it available will be free of viruses or other harmful components. Recurrent shall not be liable for any damages to, viruses that may infect, or services, repairs or corrections that must be performed, on your computer or other property on account of your accessing or use of this site. Please note that some jurisdictions do not allow the exclusion of implied warranties, so some or all of the above exclusions may not apply to you. IN NO EVENT SHALL RECURRENT BE LIABLE FOR ANY DIRECT, SPECIAL, INDIRECT OR CONSEQUENTIAL DAMAGES, OR ANY OTHER DAMAGES OF ANY KIND, INCLUDING BUT NOT LIMITED TO LOSS OF USE, LOSS OF PROFIT, OR LOSS OF DATA, WHETHER IN AN ACTION IN CONTRACT, TORT (INCLUDING BUT NOT LIMITED TO NEGLIGENCE), OR OTHERWISE, ARISING OUT OF OR IN ANY WAY CONNECTED WITH THE USE OF THIS WEBSITE OR THE MATERIAL CONTAINED IN, OR ACCESSED THROUGH, THIS WEBSITE. IN NO EVENT SHALL RECURRENT TOTAL LIABILITY FOR ANY AND ALL DAMAGES AND CAUSES OF ACTION EXCEED THE AMOUNT PAID BY YOU, IF ANY, FOR THE USE OF THIS WEBSITE. In the event any of the terms or provisions of these terms and conditions shall be held to be unenforceable, the remaining terms and provisions shall be unimpaired and the unenforceable term or provision shall be replaced by such enforceable term or provision as comes closest to the intention underlying the unenforceable term or provision. These terms and conditions shall be subject to any other agreements you have entered into with Recurrent. The materials and services at this website are intended for U.S. persons only. 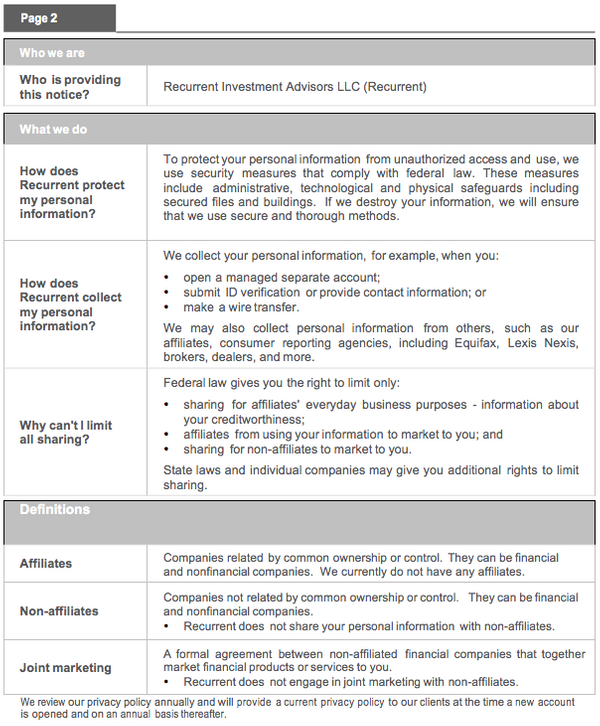 Recurrent makes no representation that this website is appropriate for use in all locations, or that transactions, securities, products, instruments or services discussed at this website are available or appropriate for sale or use in all jurisdictions, or by all investors or counter parties. Those who access this website are responsible for compliance with applicable local laws or regulations. No software at this website may be downloaded or otherwise exported in contravention of U.S. Department of Treasury or U.S. Department of Commerce regulation. These terms and conditions shall be governed by and construed in accordance with the laws of the State of Texas, applicable to agreements made and entirely to be performed within the State of Texas without resort to its conflict of law provisions. The information contained on this website is not investment advice. Any specific securities listed or discussed do not represent any or all investments purchased, sold or recommended for advisory clients. One should not assume that any investments identified are or will be profitable. Past performance is not indicative of future results.